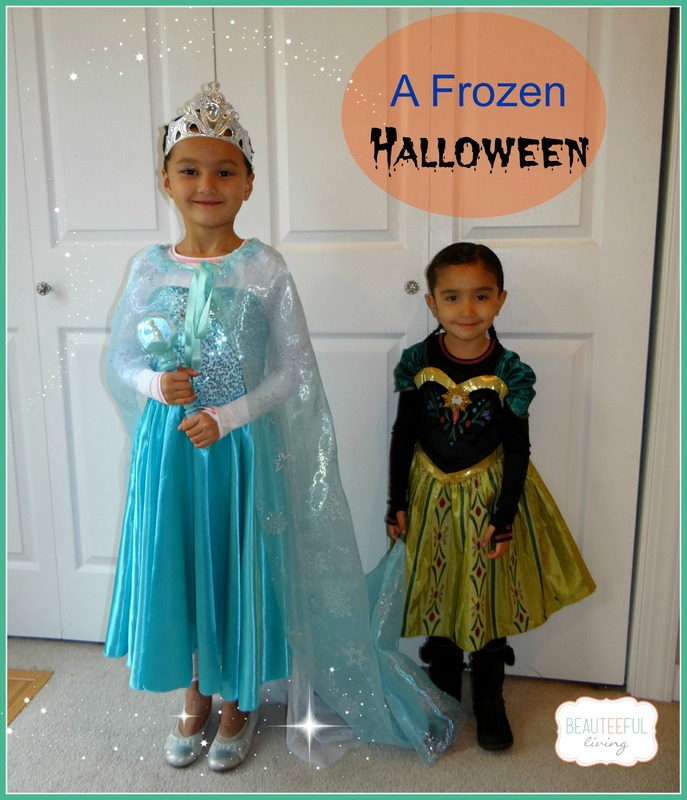 Shocker — my girls were dressed up as Elsa and Anna for Halloween last week. 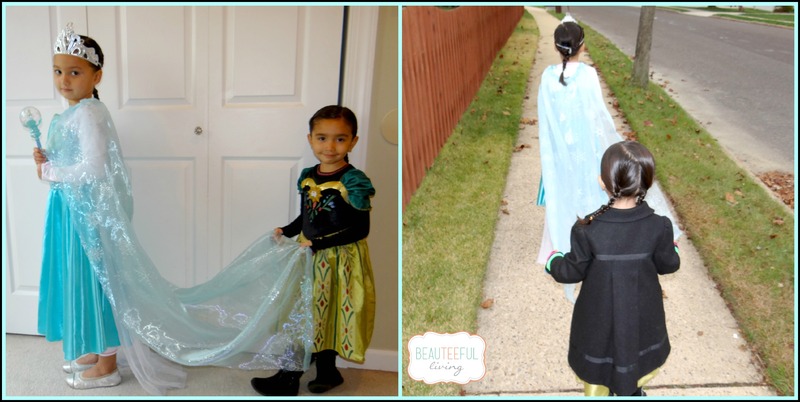 For every boy dressed up as Batman, there were probably 3 girls dressed up as Elsa. I tried my hardest to persuade my daughters to pick other characters but despite my best efforts, they could not be swayed. I knew it was serious when they simply raised their eyebrows when I tried to bribe them with a new toy. Apparently, kids do not care about standing out against the crowd! I purchased Lauren’s Anna costume in September. I actually liked it because it was a little different from the Anna costumes I’ve seen in stores since the movie came out. For Ellie’s Elsa costume, I completely dragged my feet in purchasing it. “Dragging my feet” as in a week before Halloween. I think I was holding out hopes that she would change her mind. Once reality hit that Ellie was dead set on being Elsa, I started dreaming up ways to make her costume a little more special. 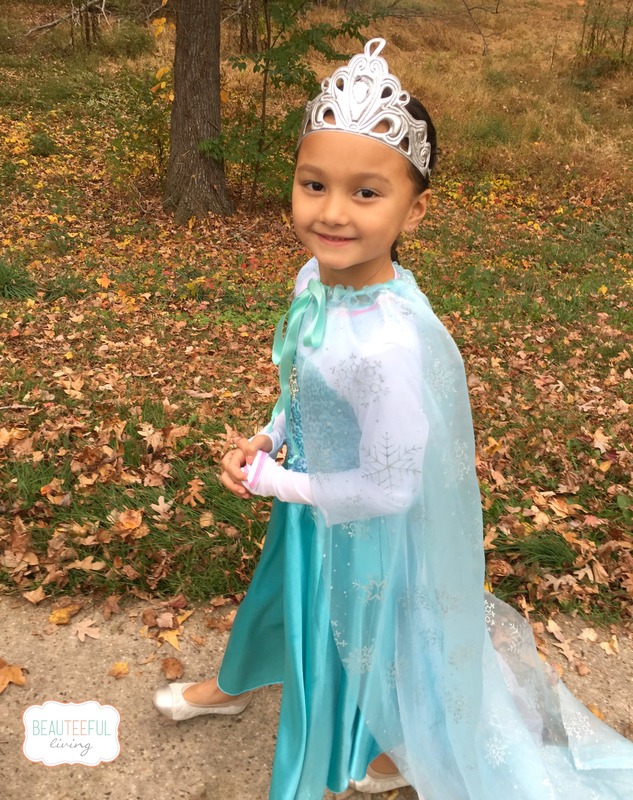 1) Queen Elsa Dress – I did not purchase the Elsa costume from Party City or Halloween Express. I lucked out by finding someone local who makes Elsa and Anna costumes. The fabric in this costume was so much better than the ones from the stores. For $25.00, it was definitely a deal. 2) Snowflake Cape – If there was anything I would be making, I knew it would have to be extremely simple. A cape? That, I can certainly do. With the help of a friend and her handy sewing machine, I made the cape with fabric purchased from Wal Mart. Yes, Wal Mart! $4.44 a yard. All I needed was 1 yard of fabric. The cape turned out exactly how I envisioned it to look! 3) Soft Crown – When I saw this silver crown in a boxed, Princess Dress-up set, I immediately envisioned it going along with Ellie’s costume. A fabric crown is by far, much more comfortable than those hard, plastic ones. Ellie kept this crown on all evening. Here is my Queen Elsa, all smiles, during her parade route. I was fortunate enough to be one of the parents walking with her class this year. While walking with Ellie’s class on the parade route, I got to chat with some of her classmates. Midway through our walk, Ellie’s buddies (the boys) started teasing about how many Elsas were in the crowd. I looked at Ellie for her reaction. She didn’t seem to be too bothered by the remarks. She did look like she was thinking though. One to never stay quiet, I had to chime in. Without skipping a beat, Ellie raised her hands and “pretended” to zap some of the boys with her powers. They laughed. Ellie laughed. I laughed. I’ll remember that moment for quite some time to come. I’ll also fondly remember one of Ellie’s classmates telling her, “Ellie, you look so pretty as Elsa.” Aww, kids can say the sweetest things! What do you think about looking like everyone else in costume? Like this post or have a comment? Thanks for reading! Frozen is taking the world by storm! Your little ones are the cutest! These are the cutest costumes. I love that they both wanted to have a frozen theme. You got off easy with each of them being one of the princess’s. That cape on the Elsa costume is gorgeous. We saw lots of Elsa’s but I don’t remember seeing one like this. So you did good! I saw a lot of Elsa’s this Halloween. Yours is just as beautiful. Your girls are so cute! Great job on the cape!! and I agree.. way cuter dress then the ones from the store. Great job momma! You are so talented. I am sure the kids enjoyed wearing them. Aww, thanks so much, Kim. She looks so lovely in her Elsa costume! They look great! I love her cape, it’s nicer then the ones I saw in the store! I love both of your daughters costumes they turned out very nice. Ellie’s cape is adorable, cute fabric! Can’t believe you found the material at walmart! So cute. Love how Lauren holds Ellie’s dress. Super cute costumes! We are having a Frozen birthday party in a couple weeks, so I may use some of your suggestions. Thanks, Miranda. 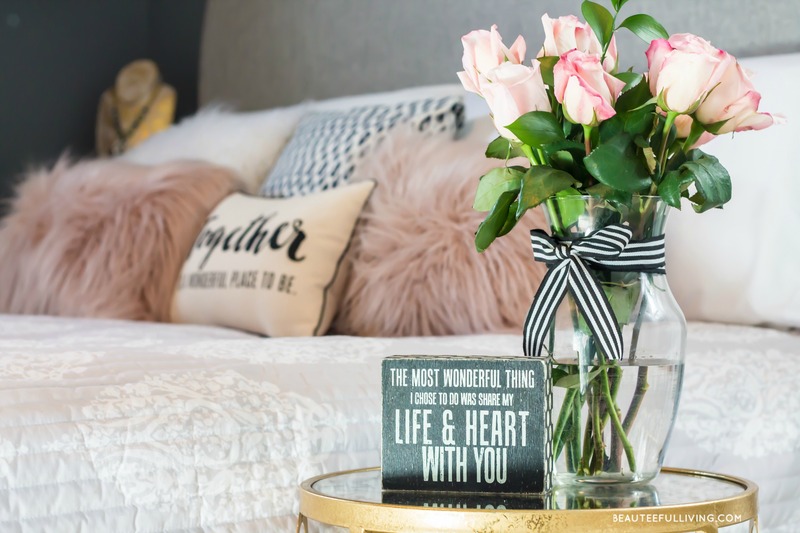 Have fun with the party planning! Their costumes are perfect! Great job! I think anytime a new Disney princess comes out, there will always be lots dressed up as them for Halloween! I remember all the Belles at Halloween when Beauty and the Beast was the big hit! Super cute! My daughter was Olaf this year for Halloween this year. Great job with the costumes! Aw, so precious! And you did a lovely job on the cape!! The girls look SO cute in their costumes. Glad they had a nice Halloween! OMgoodness….they look absolutely adorable. Lovin’ the long train. The costumes are very very lovely! Love how Elsa and Anna are standing so proud 😉 They look great and I love how Elsa’s shoes look super comfy!